Primers are essential for initiating DNA amplification, whether for the purposes of detection, cloning or sequencing. Thus, it is crucial to understand how to successfully design primers. Here are the four tips for efficient primer design and primer management. Primers are always specified 5' to 3', left to right. Verify that your primers are designed and ordered in the correct orientation. Primers for PCR and sequencing should be between 18 to 25 nucleotides in length. Primers for PCR and sequencing should have a GC content between 40 and 60%, with the 3′ of a primer ending in C or G to promote binding. The 3' end of the primer should be an exact match to the template DNA, because extension by DNA polymerase, during PCR, depends on a good match at the 3' end. In the last 5 bases at the 3′ end of the primer, make sure that there are at least 2 G or C bases (GC clamp). G-C base pairs have a stronger bond than A-T base pairs (3 hydrogen bonds versus 2). Where a restriction site has been added onto the end of a primer, typically, 5-6 nucleotides are added 5’ of the restriction enzyme site (aka a “leader sequence”) in the primer to allow for efficient cutting. Try to avoid runs of 4 or more of one base, or dinucleotide repeats (for example, ACCCC or ATATATAT) as this can cause primer mispriming. 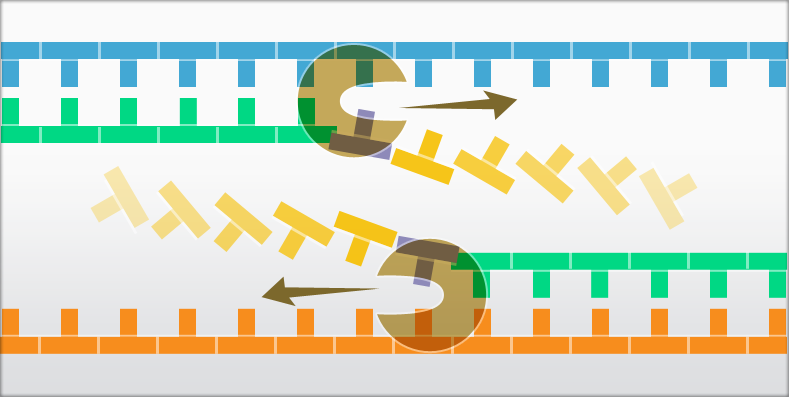 Avoid regions of secondary structure; namely intra-primer homology (more than 3 bases that complement within the primer) or inter-primer homology (forward and reverse primers having complementary sequences). These circumstances can lead to self-dimers/hairpins or primer-dimers instead of annealing to the desired DNA sequences. Thus have a balanced distribution of GC-rich and AT-rich domains. Toolslike IDT Oligo Analyzer can help you to detect secondary structure. In general, the ΔG value for dimer analysis should be between 0 to −9 kcal/mole for optimal design. Values more negative than this may adversely affect PCR reactions. For hairpins, the melting temperature, (Tm ) of the hairpin should be lower than the annealing temperature for the reaction; on average it should range between 55°C and 65°C. The Tm for the strongest hairpin should be at the very least 50°C and below the annealing temperature. If the Tm of your primer is very low, try to find a sequence with more GC content, or extend the length of the primer a little. Primer pairs should have similar Tm’s with a maximum difference of 5°C and should not be complementary to each other. Verify your primers’ specificity so they won’t bind to other genomic regions through NCBI Primer BLAST or UCSC in-silico PCR. In order to verify the Tm, try an annealing temperature gradient PCR reaction to find the optimal Tm according to your primer and enzyme. On the Genome Compiler platform, there are many useful tools that allow you to uniquely design your primers to fit your specific needs. With Primer3 algorithms embedded into the software, capabilities range from auto designing detection primers, cloning primers, and soon sequencing primers to tailoring the design of your own primers with Genome Compiler’s manual primer design feature. Additionally, Genome Compiler has step by step wizards to assist with primer and oligo design for Restriction Ligation and Gibson Assembly. Throughout the design process, Genome Compiler will also compile any design errors such as too high or too low GC content, or an undesirable Tm etc., with direct connections to IDT oligo analyser to check for hetero/homo dimer formation. Taking advantage of these helpful tools will simplify your primer design process and reduce the risk of errors. Import primers saved as files on your computer into the program’s primer library. Search the libraries for previously designed primers that would anneal to your current sequence and then “attach” them. Create new primers in the program and save them to your library for later use. Thus, by saving all of your primers in the library you will avoid unnecessarily re-designing and re-ordering primers, saving time and money. Primer libraries makes for a more organized and thus more efficient lab. With Genome Compiler's primer library feature, not only are all of your previously designed primers saved and easily accessible, they can also be shared with others. Entire primer library folders can conveniently be shared with colleagues, within your lab or elsewhere, simply by entering their emails via the “Sharing” feature. Additionally, you can choose whether to grant editing or just read-only permissions. All of the shared primers will be accessible by both you and your colleagues at any time, and the edits made by anyone are trackable. This feature makes collaboration incredibly easy, encouraging partnership and joint innovation. Good primer design is indispensable to a good experiment, so keep this advice in mind during your next genetic research project. More information on primer design and the primer library features in Genome Compiler is available in our user manual. These tips are amazing. I am bookmarking this website so that I can visit it later as well. As I wanted to become a professional webdesign in crawley, I must follow these small tips which people ignores while making the powerpoint presentation. Thank you, author, for sharing these wonderful tips with us.